Alan Ritchson’s no stranger to action-heavy roles. His resume includes The Hunger Games: Catching Fire, starring as Raphael in the Teenage Mutant Ninja Turtles films, and a role as a UFC fighter in the upcoming film, Shadow Girl. Now he’s taking on the part of Hank Hall / Hawk in DC Universe’s Titans. During our interview at the 2018 New York Comic Con, Ritchson described the process of suiting up to play Titans‘ Hawk and his knowledge of the character prior to signing on to the series. Titans debuted on October 12, 2018 and is based on the popular Teen Titans comics. Not everyone can make a superhero costume work, but you do. What was your take on that costume when they first gave it to you? Alan Ritchson: “Uh, get this thing off of me, I think. It was so uncomfortable building that thing. I mean, the process that that team took… They really poured their heart and souls into it, but I had to be the mannequin. It was like a lot of hours and hours of pushing and pulling and bolts digging in. They really built that thing from the ground up. For a long time I couldn’t see it; it couldn’t envision it. You just saw like foam things shooting off the back. It just wasn’t worth the trouble at the time. When I finally got up here and it was finished, and I put it on for the first time, I was like, ‘Man, this is pretty cool!’ So, it was interesting seeing that come to life. I hated it and then when I saw it all put together I was like, ‘This is cool!’ And now I can’t pee for the entire day, so it’s a love/hate relationship with that thing. How comfortable is it now? 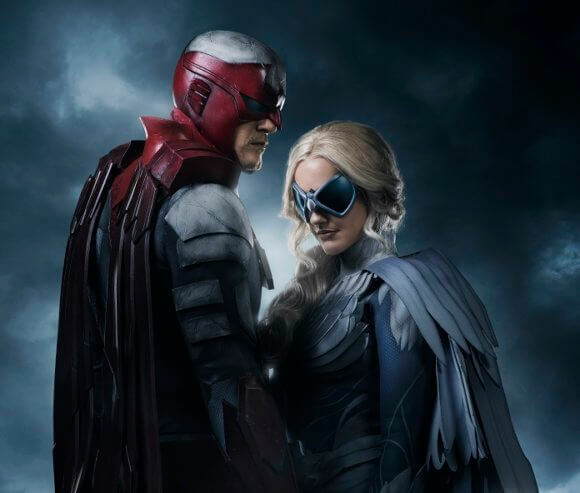 Hawk and Dove have had many different iterations in the comic books. Is there one that you took a deep dive into to get into the character? So, he pitched me and I was like, ‘Okay. I’m in. If it’s what you say it is, I’m in. Why don’t you send me some literature and I’ll read it and start getting to know this guy the way you think I should get to know him.’ And so, a box shows up and it’s one comic. I was like, ‘I guess there’s not much…’ I thumbed through that and I’m done. I think I know this guy. How does the action in this compare to the action that you’ve done in your other projects? Alan Ritchson: “It’s pretty similar. I mean, I think one of my favorite things about this business is getting to learn different trades and crafts that I wouldn’t otherwise. When I was in The Hunger Games, I hardly spent any time on screen but they had me in training for four months on a dagger so I’d look like I know what I was doing. I’d come home and at night I was like in the living room flipping these daggers. Then I’d start throwing them. I got to where I could hit a rubber training dagger, I could peg it through a rubber training mat. We have it on camera, too. It was insane what I could do with those daggers. And then immediately I go from that to Ninja Turtles with a scythe and 87Eleven, the stunt team that was on Hunger Games was there. Danny Hernandez, my trainer – I showed up for training for Raphael and it was him. I was like, ‘What?’ He goes, ‘I guess we’re just switching to a scythe.’ So now I know the scythe really well. That stuff is really cool. It takes a lot of work, but I mean who gets to learn new crafts like that? Much of what I’ve done is action. I’ve always played somebody who has to fight. Raphael or whoever. So, it’s just a slightly different version of those kind of martial arts. I actually did a movie immediately before this that isn’t out yet called Shadow Girl where I play a UFC fighter. I spent four months training MMA and then a month with Tito Ortiz because he was like the antagonist in the movie. We fought each other a bunch in the ring, and that is actually the style that we used for this guy. So, I rolled off that movie right into this. Thank god I had five months of that kind of jiu-jitsu training. That prepared me for this. But it all kind of helps, in my world at least.